Echoland is an 18-room bed and breakfast hotel, conceived and designed to provide a stylish balance between the modern demands for clean comfortable living, whilst capturing the rich ethnic flavour of the immediate Balinese surroundings. 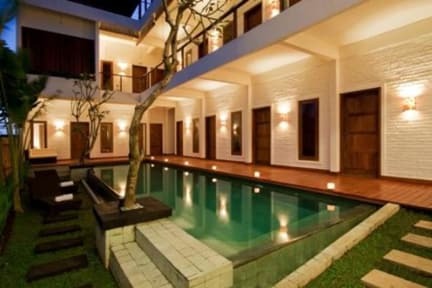 We're located in Canggu, a beautiful area just 10km away from Kuta, Bali. All of our rooms, from the backpacker's budget dorm to our most deluxe air conditioned family room, are clean, stylish and full of character. The hotel finds itself in the most delightful of unspoilt areas. It has a laid-back, friendly but professional approach, providing a high standard of amenities: swimming pool, quality bed and free Wi-Fi are just some examples of what make this Bali hotel such great value! Start your day with our delicious Indonesia/western breakfast before you begin your adventures. There is so much to do, be it learning to surf or dive, horse riding or island tours; all can be arranged from the hotel. Alternatively, if you just want to chill, there is our sea-view massage/spa available in the roof-top garden terrace or the swimming pool to lounge by and, of course, that sandy beach with its dramatic rollers is only a two-minute stroll down the lane. Tell us what your interests are and we can then see how we can best accommodate you. We're just 35 minutes from the airport and some 250 meters from the renowned surfers' beach, Echo Beach. This area provides the perfect balance for the visitor in search of both the traditions and culture of Balinese life and the natural beauty of the island landscape. Echoland is bordered by paddy fields that are overlooked by towering volcanoes and within earshot of the powerful waves from the Indian Ocean that have delighted surfers for decades as they crash against the sandy beach. Echo Beach maintains its traditional village character but, with its increasing popularity, a cluster of restaurants, bars and shops can now be found nestling on the seafront. These provide a range of quality cuisine, together with live music in the evenings, and are the perfect place to relax and watch the surfing and take in the natural atmosphere and sheer beauty of this unique shore line. 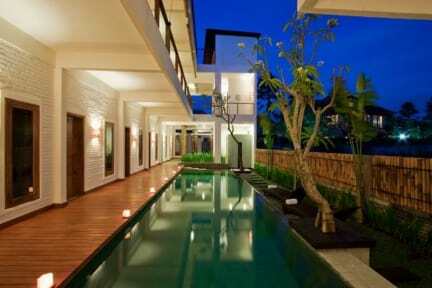 Echoland is an ideal place to make your base, enabling you to feel and explore the real Bali. It is a peaceful escape from the highly developed and bustling areas of Kuta and Seminyak which, although only a short 25 minutes' and 15 minutes' drive away, respectively, seem to be a whole world away. Great place to stay, the staff were wonderful people! We stayed at Echoland B&B for two weeks - and we’d definitely do it again! The staff was super friendly and polite, the rooms got cleaned every day, the beds were made and we even got towels. For the price we paid we also got very good breakfast, and the pool was always refreshing after a hot day out in Canggu. Overall, the neighborhood was quiet and nice to walk around in, also during the night. I’d definitely recommend this place, and I will visit again the next time I’m in Canggu! Great clean hostel but not an excellent social aspect. Which is fine if you're just looking to visit the area and not socialise. Great value for money. So lovely i’m booking to go back towards the end of my trip. Staff couldn’t be nicer, breakfast is a really good size, facilities great. What a cool spot! The staff were incredible, and so was the delicious breakfast, not to mention how much food it was. The rooms were not exactly my favorite, but the top floor common areas, as well as the pool, were awesome. Can’t wait to go back. Super easy to rent scooter or get a service to other places throughout Bali! Nice pool, but gets no sun after morning. The dorm room isn’t horrid but there’s no privacy. Staff were friendly. Currently super noisy due to construction site next door... I know it can’t be helped but it should be noted on websites they advertise on.